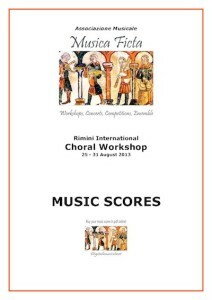 Only few days are left from the beginning of the ‘Rimini International Choral Workshop’! Tutors, as usual, will be Peter Phillips (Tallis Scholars director), Ghislaine Morgan and me! I want to make you a special gift: The booklet of the Workshop, containing all the music scores in PDF format. And we have still space to accept your application. Just go on our webpage at www.musicaficta.org/welcome.html and send an online application!